Ran into a question from a client the other day that asked how to deal with Internet Connection settings for running HTTP requests. In this case this is an old FoxPro app and it's using WinInet to handle the actual HTTP connection. Another client asked a similar question about using the IE Web Browser control and configuring connection properties. Regardless of platform or tools used to do HTTP connections, you can probably configure custom connection and proxy settings in your application to configure http connection settings manually. However, this is a repetitive process for each application requires you to track system information in your application which is undesirable. 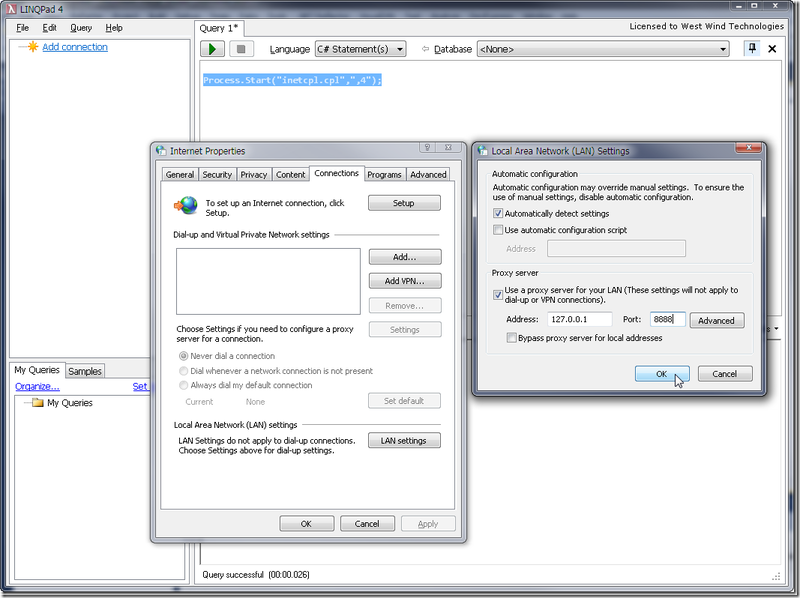 This dialog controls the Windows connection properties that determine how the Windows HTTP stack connects to the Internet and how Proxy's are used if configured. Depending on how the HTTP client is configured - it can typically inherit and use these global settings. and you can use any Shell execution mechanism (Run dialog, ShellExecute API, Process.Start() in .NET etc.) to invoke the dialog. Changes made there are immediately reflected in any applications that use the default connection settings. 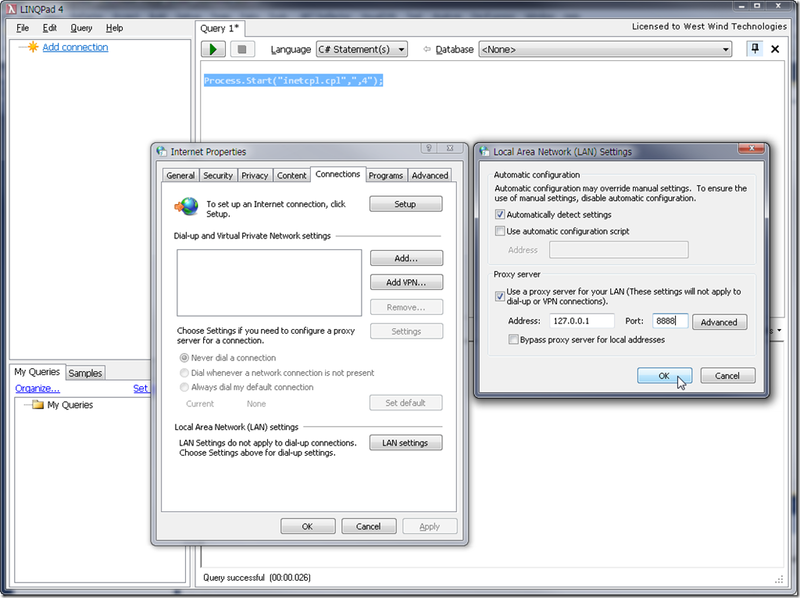 The second parameter of 0 specifies that the default system proxy settings should be used and it uses the settings from the Internet Settings Connections tab. Other connection options for HTTP connections include 1 - direct (no proxies and ignore system settings), 3 - explicit Proxy specification. In most situations a connection mode setting of 0 should work. All of this is pretty easy to deal with and in my opinion is a way better choice to managing connection settings than having to track this stuff in your own application. Plus if you use default settings, most of the time it's highly likely that the connection settings are already properly configured making further configuration rare. Thanks for the info about those settings, I've seen trouble with that on client web services. Just an FYI, the image link is broken. I have wanted to find to using proxy setting. this post is great. thanks many.